“We have to learn to adjust to him and it is very exciting. The paintings are very difficult for anyone to copy, if you see the originals they will challenge you”. The artist at his literally “brilliant” best, a development from “Sunset 1 August 2006, over the Massif Central“. 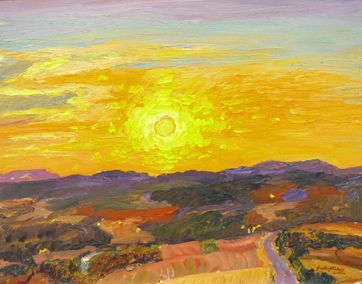 The heat, vibrancy, and sheer dazzle of the sun is incredible, exceptional and contrasts brilliantly with the hot, brooding mystery of the landscape both of which challenge the imagination of every viewer.